In 2018 UMW made the business decision to solicit proposals from established and qualified firms to operate the university’s Bookstore. Barnes & Noble Education rose to the top as a result of this competitive process and was recently awarded the contract. Barnes & Noble will continue to focus on UMW’s priorities around student success, including competitively priced course materials with scalable and various delivery options, exceptional service to the community, and commitments of support that include course material scholarships for students and financial contributions for student activities. The agreement also brings expanded marketing and public relations opportunities and a financial return to the university. Barnes & Noble representatives prefer to hire existing staff and current employees wishing to stay on will become Barnes & Noble employees. Committed to a successful transition, members of the Barnes & Noble team recently met with stakeholders integral to the April phase of the transition. While these initial transition processes advance, the team will return in May to meet with faculty and staff representatives as part of the planning and implementation process. The Bookstore will close after regular operating hours on June 27, 2019, and re-open on July 8, 2019, as the Barnes & Noble/University of Mary Washington Bookstore. A Grand Opening Celebration is planned for late September or early October. Donors in 45 states and nine countries made more than 4,000 gifts to UMW topping $600,000. 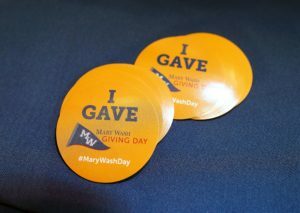 The UMW community came together on a sunny Tuesday in March to take part in the third annual Mary Wash Giving Day, a 24-hour online fundraising event to benefit students and programs across the University. The day’s final donation total—after all online and offline gifts were counted—exceeded $600,000. Donors from 45 states and nine countries, including alumni, faculty, staff, students, parents and friends of the University, made more than 4,000 gifts on Giving Day, surpassing the goal of 3,500. These results broke last year’s Giving Day record and represented a 34% increase in gifts and a 33% increase in dollars raised. Read more. The Women’s Leadership Colloquium @ UMW’s next networking event will be held on Tuesday, May 7 from 5:30 p.m. – 7:00 p.m. at Stevenson Ridge. Be inspired as you learn from Sara Branner and Mindy Gray, Co-Owners of SaraGray Designs, LLC, how to find and refinish furniture using Annie Sloan Chalk Paint. Participants will discover practical tips and gain the confidence to paint a piece on their own. A finished piece will be given away to one lucky person! All attendees will also get to experience one of their DIY workshops. SaraGray Designs, LLC is a “Pop Up” studio/shop in Remington that features painted and farmhouse furniture, home accessories, jewelry, artwork and paper crafting items. DIY workshops are also held during the month. Light food and wine will be provided. Cost per person: $15. Across the nation, April is celebrated as Sexual Assault Awareness Month (SAAM). This is a time for raising awareness of sexual assault and gender-based violence, as well as celebrating the strength of survivors, passion of advocates, and compassion of allies. The theme of SAAM 2019 is “I Ask,” a phrase that relates to the ways we ask for and give consent in our daily lives. From hugs to sharing photos on social media, consent is a part of every healthy relationship. Development of this communication skill requires practice. We hope you’ll join us at one of our many educational, empowerment, and awareness events this month. There is something for everyone to learn. The University of Mary Washington hosts the 29th annual Multicultural Fair in Ball Circle on Saturday, April 13 from 10 a.m. to 5 p.m., rain or shine. Exemplifying UMW’s commitment to enhancing multicultural awareness, the Multicultural Fair provides an entire day devoted to multicultural entertainment, children’s activities, international and American food, and ethnic craft vendors. This event is free and open to the public. Gari Melchers Home & Studio will host its eighth annual Beeping Egg Hunt on Sunday, April 14 from 2 – 4 p.m. The egg hunt provides an opportunity for visually impaired and blind children, along with their families, to participate in an accessible audible egg hunt. Sighted siblings can also participate by wearing a blindfold. This free event will run from 2-4 p.m.
Gari Melchers Home & Studio hosts its Beeping Egg Hunt on Sunday, April 14. The specially designed plastic eggs, donated by Stafford County-based International Association of Bomb Technicians and Investigators, emit a beeping sound that allows children to retrieve the eggs using their hearing. The event also includes a miniature animal petting zoo, sensory crafts, gallery activities, and Wegmans-sponsored healthy snacks. During the 1920s and 30s, Corinne Melchers, with her husband’s encouragement, hosted Easter parties for area children at their Belmont home featuring egg rolls, puppet shows, and plenty of favors. Gari Melchers Home and Studio is a 28-acre estate and former residence of the artist Gari Melchers and his wife, Corinne. The property, which is operated by the University of Mary Washington, is both a Virginia Historic Landmark and a National Historic Landmark. Located at 224 Washington St. in Falmouth, Va., a quarter mile west of the intersection of U.S. 1 and U.S. 17, it is open daily with an admission charge. For more information or to RSVP, contact Michelle Crow-Dolby at mdolby@umw.edu or 540-654-1851. Last semester we contracted with the Huron Consulting Group out of Chicago to help develop a plan to improve the University’s financial future and better support student success. After several months on campus and working closely with a UMW Steering Team chaired by Dr. Jeffrey McClurken, the Huron consultants helped draft a Student Success Plan that will empower students to succeed while ensuring institutional sustainability. The Student Success Plan is an action plan of prioritized steps to recruit, enroll, retain, and graduate students. This data-driven plan engaged a wide-range of UMW constituents including faculty, staff, students, administration, regional high school counselors, and alumni. This important qualitative data was cross-referenced with a quantitative analysis that assessed different demographic, financial, academic, and student engagement factors from recruitment to post-graduate success to better assess the challenges and opportunities involved in recruiting, retaining, and graduating students. This analysis led to the development of goals, recommendations, and actionable tactics aimed at enhancing the UMW student experience and the University’s strategic position. The steering committee recommended strategies and tactics to achieve these goals but also made clear the need to prioritize our efforts. As a result, we will prioritize those action items that will help improve retention, rebrand the Mary Washington experience, and improve the yield of admitted students. Improved retention and yield will have an immediate impact on UMW’s ability to increase net-tuition revenue, sustain academic quality, and enhance our academic reputation. As a part of the Student Success Plan effort, UMW is also considering changes to its tuition price structure, as the Governor looks for institutions to provide students and families greater transparency and the ability to plan financially for four years of enrollment. UMW will also develop budgets that better align tuition and fee revenue with expenses, ensuring the alignment of resources with strategic priorities as well as allowing for greater transparency and accountability. Achieving these goals will have a positive impact on net-tuition and fee revenue that will both support new strategic investments and reinforce UMW’s reputation for student success. Implementation and realization of these goals is attainable but will require us to work together in new ways. To facilitate the implementation efforts, we will need to augment the use of data and information sharing to ensure accountability to students and the campus community. We will be presenting a full report of the Student Success Plan to the Board of Visitors at the upcoming April 12 meeting. Following this report, we will more broadly share with campus the substance of this plan and the data analysis that informs the goals, strategies, and tactics embedded in the plan. In addition, I will hold a meeting with all faculty and staff on May 9 in the Chandler Ballroom of the University Center to provide a report on this plan and our priorities for the next year. I will also meet with students at a Can We Talk session in the fall. Thanks to each of you who makes this learning community so special. Despite our challenges, we have accomplished a great deal over the past year, and our reputation for academic excellence continues to rise. As we enter the home stretch of this academic year, I wish you well and encourage you to take care of yourself. Community Outreach and Resources (COAR) is hosting our annual Spring Forward Festival on Sunday, April 7th from 1:00-4:00 PM on the Brompton Lawn. We are reaching out to invite UMW faculty and staff to join us with their families for a fun-filled afternoon of crafts, games, snacks, and an egg hunt! The event is free to attend and parking will be available along Hanover Street. All children must be accompanied by an adult. Additionally, in the event of rain, the festival will be cancelled. Attached is a flier with all of the details. Any questions can be directed to (540) 654-1802 or coarumw@gmail.com.